As with any other joint, the TMJ can be subject to orthopedic problems including inflammation, sore muscles, strained tendons and ligaments, and disk problems. 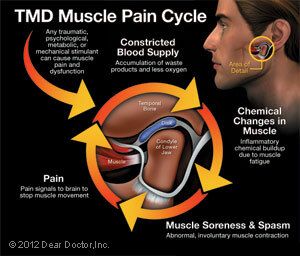 We also know that TMD is influenced by genes, gender (women appear to be more prone to it), and age. Muscle Pain — This can be felt in the cheeks (masseter muscles) and temples (temporalis muscles), where the two big pairs of jaw-closing muscles are located. If you feel soreness and stiffness upon waking up in the morning, it's often related to habits such as clenching and/or grinding the teeth at night. If you have this type of nocturnal habit, we can have a nightguard custom-made for you that should be very helpful in decreasing the force applied to your teeth, which will in turn allow your muscles to relax and relieve pressure on your jaw joints. Once we examine you, we will come up with a strategy for treating your condition and managing your pain. Sometimes a temporary change to a softer diet can reduce stress on the muscles and joints. Gum chewing can also contribute to increased stress on the jaw joints and should be avoided. Ice and/or moist heat can help relieve soreness and inflammation. Muscles in spasm can also be helped with gentle stretching exercises. Severe TMD cases may require more complex forms of treatment, which might include a mouthguard/splint, orthodontics, or dental restorations like bridgework. 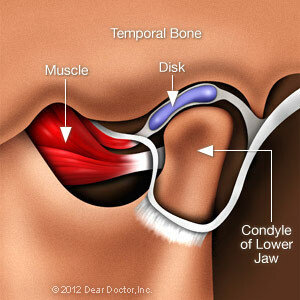 It's rare for major surgery ever to be necessary in a case of TMD. Again, it's important to try the wide range of conservative, reversible treatments available, and give them enough time to work as they almost always prove effective. The first step is to schedule a consultation with Dr. Trimmell, Dr. Anders, Dr. Snider, or Dr. White. They will assess your specific symptoms and concerns and work with you to develop the most appropriate treatment plan for you.